Time to raise a ruckus! District 3's Representative Scott Tipton is working agains the wishes of the majority of his constituents. He supports 3 bills that wrench control of energy development from feds, classify finite resources as renewable, and incentivize development by letting states collect royalties. This terrible trifecta tears at the heart of our wild public lands. The Federal Land Freedom Act (H.R. 3565 in the House and S. 335 in the Senate) would allow states to “assume the federal leasing, permitting and regulatory responsibilities for oil and gas exploration, development, and production” on U.S. public lands. This is yet another ham-fisted attempt to circumvent protections for federal lands by transferring “oversight” to state governments. The Federal Land Freedom Act contains a number of troubling provisions, excluding these national lands from the Endangered Species Act, common sense look-before-you-lease environmental reviews, and protection of heritage resources. The bill hands over America’s publicly-owned mineral resources for massive oil and gas development. It’s a land seizure bill, but with even more dire consequences for taxpayers and wildlife.This is an outrageous attack on our public lands. It must be stopped in its tracks! Next up, the Planning for American Energy Act (H.R. 2907) reintroduced by Rep. Tipton, would require the Interior Secretary to pervert the concept of “sustained yield” — originally applied to renewable resources such as timber — and apply it instead to non-renewable resources such as oil, gas, coal, and even uranium.It would force the government to project energy needs and provide a plan that would have to include both renewable and nonrenewable energy sources, regardless of market forces. This would open the door of industry to lobby the Energy Information Administration to inflate those projected energy needs, and demand that fossil fuels be identified by the government as a required solution to meet those needs, regardless of the efficacy of clean energy sources like wind, solar, and hydro. It also prioritizes public lands as the first point of extraction of these resources, despite the multitude of other public lands values we hold dear. This bill is a thinly veiled attempt to skirt market forces and public opinion to force the adoption of fossil fuels behind a curtain of impenetrable bureaucracy. 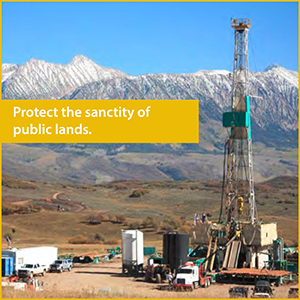 Tell Scott Tipton you DO NOT support this sneaky attempt to force dirty energy on the American people at the expense of our public lands. Finally, the State Mineral Revenue Protection Act (H.R. 2661) would require royalty payments from the extraction of resources owned by all U.S. citizens to be paid directly to the states where they are extracted. 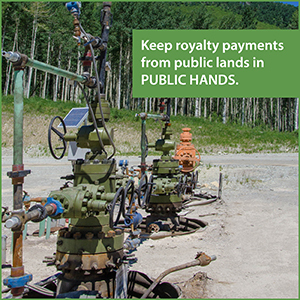 This sinister move would work hand in glove with the Federal Lands Freedom Act by incentivizing states to rubber stamp industry, granting industry unfettered access and rewarding that graft with royalties skimmed from the Treasury. This is not how our system was designed to work, and these bills are attempting to circumvent reasonable protections to our shared public lands. Time and again, Americans (and especially Westerners) have declared in favor of keeping public lands in public hands. Please tell the misguided Scott Tipton that he is acting contrary to the wishes of his constituents.